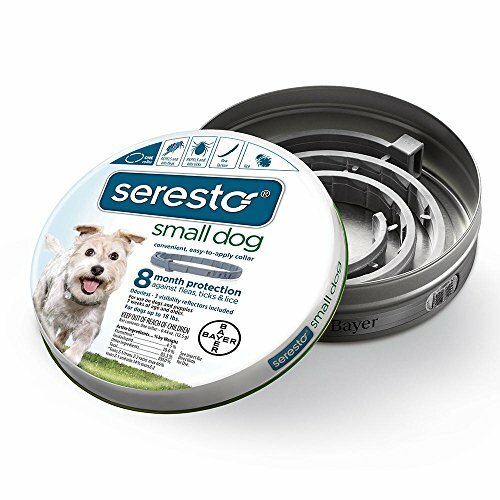 The Bayer Seresto Flea & Tick Collar for Small Dogs up to 18 pounds provides continuous 8- month flea and tick protection. Unlike oral products, the Seresto collar repels fleas and ticks and kills through contact with no biting required. Based on label claims, Frontline flea and tick treatment does not repel. Seresto dog collars are made with a low concentration formula for continuous release protection over your dog's skin and coat. Vet-recommended Seresto collars are water resistant and remain effective after shampooing, swimming or exposure to rain or sunlight. * The odorless, non-greasy collar is easy to apply and can be used alongside other identification or restraining collars without damaging them. Plus you don't have to remember to apply monthly treatments. Get effective protection from Seresto. *In order to maintain an 8-month duration, dogs must not be bathed more than once per month. For dogs that swim once a month or more, the control duration is reduced to 5 months for flea control and reduced to 7 months for tick control. View More In Flea & Tick Control.